First things first. 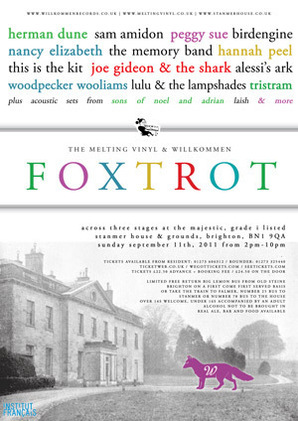 Laish are playing at the Willkommen Foxtrot festival this year, held at the beautiful Stanmer House in Brighton. 11th September. We are playing a totally unplugged set on the grounds. Expect material from our (sort of almost finished ish) new album with an almost entirely new bunch of excellent musicians. There is also an excellent little Foxtrot themed show the night before called ECHO at the Caxton Arms in Brighton. Featuring our very own Emma Gatrill, (who has just produced an amazing debut album of harp, cello and clarinet orchestrated songs), Sons of Noel and Adrian singer Cathy Cardin aka Redwood Red, and Laish and Dancehalls violinist and singer, Martha Rose and a whole bunch of added musical surprises. The other big news here is that I’ve been putting together a Willkommen Collective compilation of collective bands called ‘Willkommen Foxswap’ covering songs by other collective members. http://willkommencollective.bandcamp.com but the site is not ready until 6th September! What else? We are making a music video. You’ll be the first to see it when it’s finished. Right then, in a bit. Go outside.